Salvador has hosted the two biggest games of the World Cup thus far, and both of them have ended with a 4-goal differential. This one, however, didn’t make it past half-time, with Germany utterly dismantling Portugal even before Pepe’s 37′ dismissal. Portugal started in their expected 4-3-3 with Ronaldo and Nani attacking–theoretically, at least–from the wings. Their changes were enforced. The 28′ introduction of Eder for the injured Hugo Almeida did not initially change the structure. After Pepe’s 37′ red card, Portugal initially shifted to a lop-sided 4-4-1, with Raul Meireles dropping into the back four and Nani doing a better job of tracking back than Cristiano Ronaldo, who tended to remain in an advanced position. Late in the half, in fact, he was briefly positioned ahead of Nani to the left of Eder. To start the second half, Paulo Bento shifted his team to a 4-3-2, bringing on defender Ricardo Costa to take over at center-back, with Meireles replacing the substituted Miguel Veloso as the deepest-lying in a midfield three that now included Nani on the left, and Ronaldo officially up top to the left of Eder. Germany, on the other hand, shook things up from the start. Moving Lahm to the midfield, in keeping with his role at Bayern this season, wasn’t completely unexpected and the resulting changes to the back line (Jerome Boateng’s move to right back and the introduction of Mats Hummels) were the logical consequences of that change. But Jogi Löw’s shift from 4-2-3-1 to 4-3-3 changed everything in attack. Mesut Özil moved from his central role out to the right, while Germany’s other central creator, Mario Götze, ended up on the left. Whether for tactical reasons or because of questions about his knee, Bastian Schweinsteiger lost out to Sami Khedira and Toni Kroos in the midfield, playing ahead of Lahm. 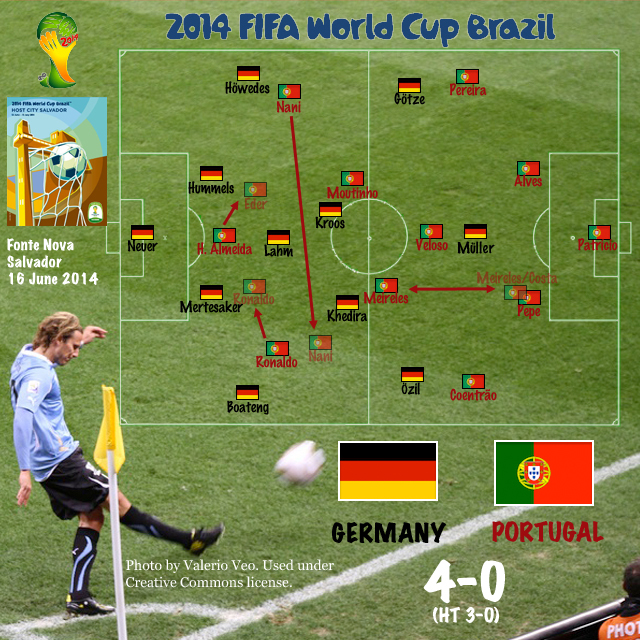 This gave Germany an incredible degree of midfield control, and the game reflected it. Jogi Löw (Ger) – This was a comprehensive win, and given Germany’s changes, you have to credit the architect. Lahm and Kroos especially dominated the midfield, but Khedira was also quite effective, as were Özil and Götze in the final third. Jerome Boateng also deserves credit for his role in keeping Ronaldo quiet. It’s probably a sign of a well-executed plan when one of the least important figures in a game is the one who managed to score a hat trick. Of course, one player who wasn’t part of Löw’s plan also contributed significantly to Germany’s success . . .
Pepe (Por) – With all players, you have to take the good with the bad. It’s pretty clear which Pepe offered tonight. Particularly if the United States manage to win a point off Portugal on Sunday, Pepe’s nuzzling of Thomas Müller will look like a major lapse. With the injury to Coentrão as well, the U. S. may be facing a back line almost as untested as their own.